Those two structs together with their allocation and compare functions comprise the basic code we need to start building a graph. Full code can be found in graphs/graph_ve.c . Now that we have a way to represent edges and vertices, we need a convenient way to represent the graph itself. Namely, we need to be able to quickly and conveniently identify, add and remove vertices and edges. There are two traditional approaches to do that, each with its own appropriate usages: adjacency matrix and adjacency list. Adjacency matrices use a matrix to represent edges (and possibly the edge’s value), e.g. if graph G has v vertices, matrix E(v x v) represents G’s edges, each matrix element representing if the edge exists and if so what value it has. This is a fast and straightforward approach to representing edges, but the fixed n² space requirement is very bad if we have a sparse graph, which unfortunately is often the case. 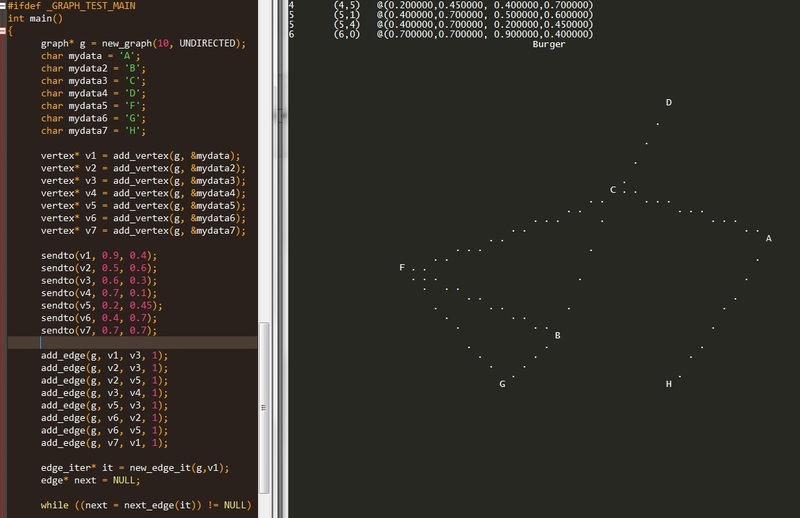 Adjacency lists on the other hand use lists to represent edges. Each vertex has it’s own list holding pointers to all of its neighbors. In its simplest form, a graph G(V,E) will have an |V| sized array with lists containing only integers (corresponding to the vertex id) – adj_list[a] would contain the ids to every neighbor of vertex v with id=a. We’re using linked lists with our edge struct. Adding and identifying vertices is trivial: vertex v with id=i is located at vertices[i]. Adding edges is also trivial (adding edge* to the linked list). If we have an undirected graph, we add 2 edges instead, one at adj_list[vertex_from] and one at adj_list[vertex_to]. Testing code can be found in the test folder together with some drawing functions that print the graph with our BurgerGFX utility. This is a graph implementation with adjacency lists. located at the adj_list array (double pointer to linked list).